From Francis George Heath’s The Fern Paradise: A Plea for the Culture of Ferns. 1850s London, as described by Charles Dickens in Bleak House: “Smoke lowering down from chimney-pots, making a soft black drizzle, with flakes of soot in it as big as full-grown snow-flakes — gone into mourning, one might imagine, for the death of the sun.” The soot, the mud, the heavy London fog are used by Dickens to introduce the confusion and corruption of London’s High Court of Chancery, but the description also captures a very real environmental phenomenon in London. Fifty years later, Claude Monet’s paintings of Parliament documented the same heavy smog, the result of coal smoke and gas lamps. There were early innovators, such as Benjamin Thompson (1753-1814) and Benjamin Franklin (1706-1790), who developed “smoke-free” stoves to remove smoke from within the home. But this smoke could only go so far, and it became the key ingredient of the pea soupy miasma of industrial cities. This smog killed people. It is also worth noting that the increased use of coal, beginning in the eighteenth century, was predicated on awful working conditions for miners and their families. In this context, it may not seem particularly tragic that the smog could make it difficult to maintain a tasteful garden! But it is fascinating to tease out how technologies (and people) adapt to changing circumstances. The introduction of the Wardian Case, invented by and named for Nathaniel Bagshaw Ward (1791-1868), is an excellent example. 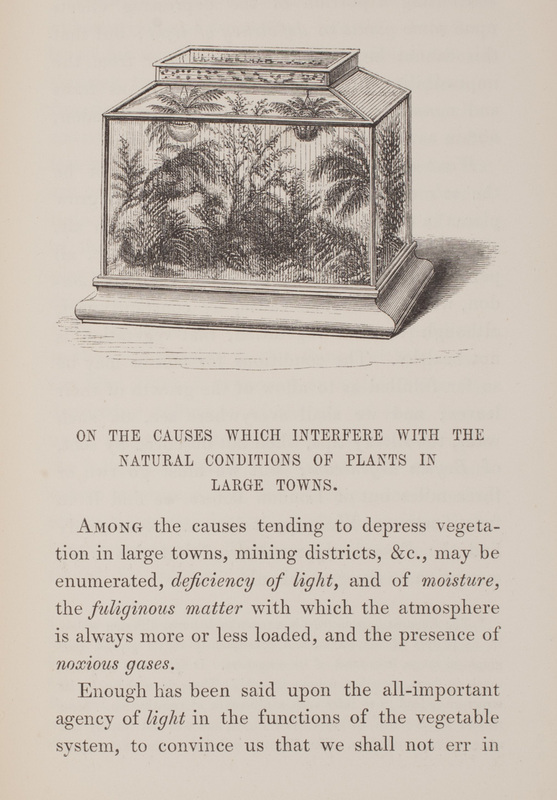 From N. B. Ward’s On the Growth of Plants in Closely Glazed Cases. 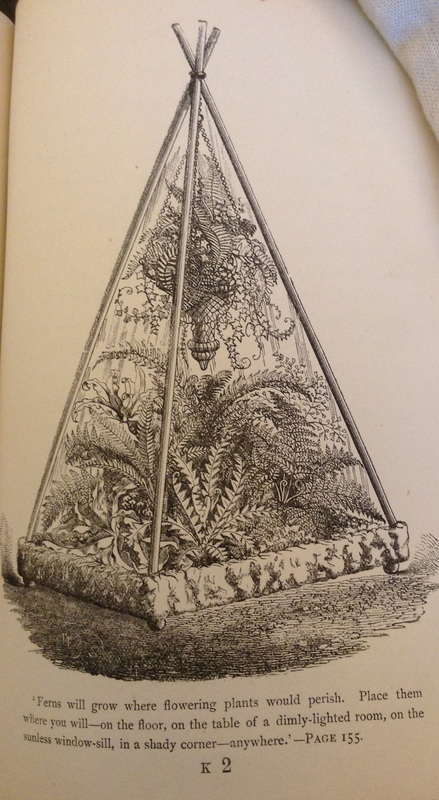 This case, akin to a terrarium, became popular very quickly because it could foster the growth of delicate plants in a sealed system. This protection was necessary because of the aforementioned air pollution, as well as the increasing interest in delicate plants such as ferns. It became so commonplace that in 1856 Shirley Hibberd asked, “Who would live contentedly, or consider a sitting-room furnished, without either a Ward’s Case or an Aquarium?”; the cases were popular among the middle class audience reached by authors like Hibberd and J. C. Loudoun. They were costly enough to be status symbols but less prohibitively expensive once English excise duties on glass were lifted in 1845. They created climates that suited the exotic plants imported and sold by nurseries such as that run by the Loddiges family. The cases compounded their own utility by being used onboard ships to transport fragile plants from overseas. And, as indicated by Hibberd, their design suited the Victorian taste for features like aviaries and aquariums. From Shirley Hibberd’s The Fern Garden. Wardian cases could support flowers, moss, and ivy. But Ward’s initial goal had been to develop a safe environment for his ferns. 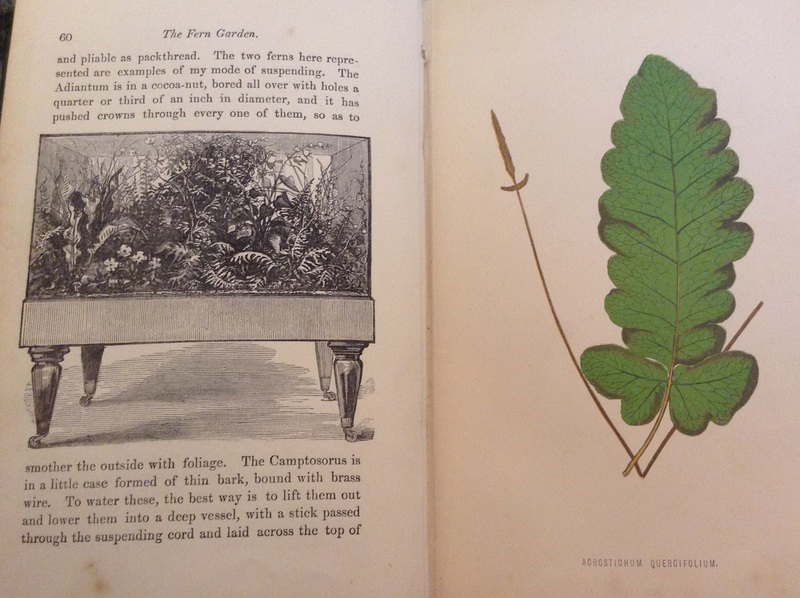 The Wardian case was one of the many manifestations of the Victorian fern craze, along with the cultivation of rockeries, the collection of pressed specimens, the creation of cyanotypes and nature prints (about which I will write further in an upcoming post), and other manifestations in decorative art. The cases, unlike some of these other technologies, could host living ferns and could remain on display as part of the furniture of a tasteful drawing room. Ferns were suited to the era’s fascination with the delicate, the intricate, and (to return to Hibberd) there are those who argued that it required excellent discernment to appreciate ferns, precisely because they were not gaudy with flowers. What is coal? It is, ironically, the product of ferns. Over 300 million years ago, our earth was inhabited by giant insects and ferns the height of trees. When those ferns died, they sank into the swampy ground and compressed, first into peat and later into coal. This fossil fuel, when burnt, filled cities with smog and necessitated new technologies to protect fashionable plants. 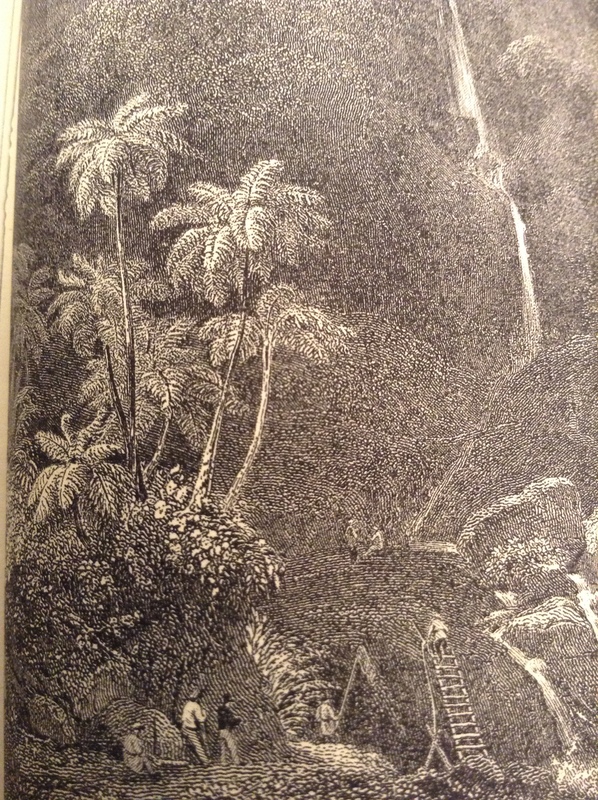 Tree ferns in Java, from John Lindley’s The Treasury of Botany. Heath, Francis George. The Fern Paradise: A Plea for the Culture of Ferns. Sixth edition. London: Sampson Low, Marston, Searle, and Rivington, 1880. Hibberd, Shirley. Rustic Adornments for Homes of Taste: And Recreations for Town Folk, in the Study and Imitation of Nature. London: Groombridge and Sons, 1856. Ward, N. B. On the Growth of Plants in Closely Glazed Cases. 2nd. ed. London: John Van Voorst, 1852. This is an extremely interesting blogpost. I have a Wardian Case in my front room, and never knew what it was called! Thanks for the information and for the fine entry.